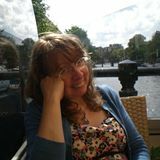 Dr Kathy Hopewell is a part time lecturer at Bangor University in North Wales, teaching literature, women’s studies and creative writing. She has been writing fiction since 2006 and Swimming with Tigers, a re-imagining of the lives of the women surrealists, is her first novel. It was longlisted in the Mslexia Women’s Novel competition. She performs spoken word and sound compositions with her partner David, as Hopewell Ink. Her interests include singing with a community choir, which has performed pieces featuring her poems. She started a Reading Group in 1989 which is still going. She buys a lot of clothes from Boden.